Hawthorn is a very common widespread deciduous shrub or tree that is frequently found in hedges. 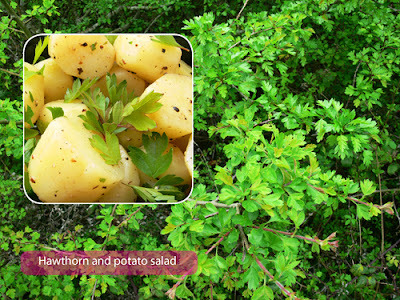 Now that the young hawthorn leaves are out, here is a quick and simple potato salad with young hawthorn leaves. Apart from the edible berries that you can make a reasonable jelly out in autumn, you can also eat the young hawthorn leaves this time of year. The young April leaves that were once called 'bread and cheese' many decades ago have a pleasant nutty taste which can be used in salads or any recipe that uses wild spring greens. Hawthorn flower wine (out in May) was also quite common in former times.